Sandhill cranes have filled the Platte River valley. They’re in nearly every field within 5 miles (or more) of the river. Bird watching is pretty easy when you just have to pull over to the side of the road to see a few thousand cranes feeding, dancing, and calling to each other. It’s a great experience, and widely accessible to anyone with a car and a few extra minutes to pull off the interstate and drive a few county roads. Sometimes, as was the case this past weekend, there is even a big white crane mixed in with the sandhill cranes – just for a little extra excitement. On the other hand, while seeing the birds in the fields is fantastic, it pales in comparison to the experience of sitting in a viewing blind on the edge of the river watching the cranes pour out of the sky into their river roost sites in the evening, or sneaking back into the same blind early the next morning to watch them wake up. Looking through windows cut in the burlap front of a crane viewing blind along the Central Platte River. The birds were just waking up in the early dawn and starting to get noisy when this photo was taken. It’s tough to beat an early morning in the blind. Arriving well before sunrise, it’s usually hard to tell how many birds are on the dark and nearly silent river. Then, as the light slowly comes up, thousands of silhouettes appear on the water and start to shift around. As the sun slowly rises, so does the volume of the crane cacophany. On most mornings, the cranes stick around for an hour or more after the sun is fully up, providing plenty of time to watch and listen to them at close range. Awesome. If you’ve never had the experience, what’s stopping you? You can make reservations through Audubon’s Rowe Sanctuary or the Crane Trust Nature and Visitor Center. While you’re in the area, stop by and hike one of the trails through our Platte River Prairies. 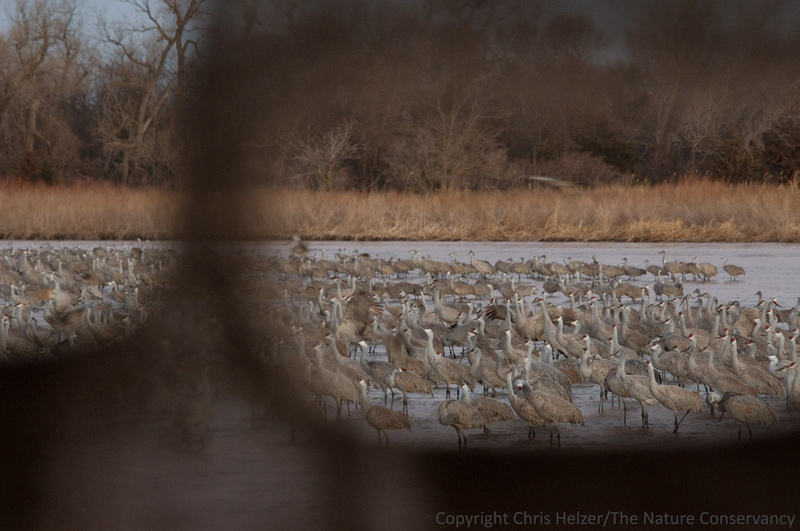 This entry was posted in General, Prairie Natural History, Prairie Photography and tagged birds, nature, nebraska, photography, platte river, roost, sandhill cranes, viewing blind by Chris Helzer. Bookmark the permalink. The female giant red sided garter snake that lives in my garage….says hi!!! She caught one of the pesky mice frequent my garage last night and I had to move her so I didnt run over her today..(she was still swallowing it)!!! !